This mother and ducklings are more afraid of me than of the heron. I am starting a new series. I found a file entitled Photos June 2011 and it contained 6.77 gigs of shots from June - October 2011. I found tons of 'lost' photos. They are from the Canon Powershot SX10 IS, so the files are much smaller and quicker to upload. I have really enjoyed going through this file. 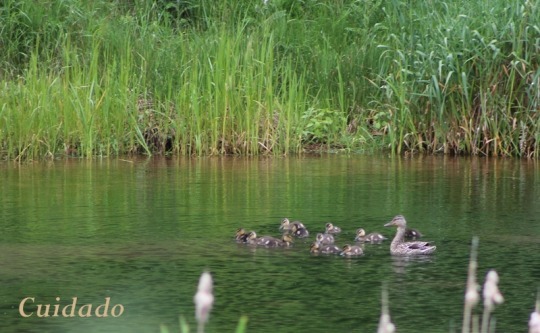 Below are newly hatched ducks from another year on my pond. I love the way the heron is looking at the ducks Mary! Mary MacADNski: Mama is quacking loudly about my presence. Mary MacADNski: Mama is more concerned about me I think. Mary MacADNski: I have really enjoyed it. If only you could have made friends Mary. Mary MacADNski: I think we have made friends. The ducks will stop in and have their babies here again and Monsieur Heron has returned each year since. Its so lovely to see new life such as this. let's hope they make it through to adulthood. Mary MacADNski: Quite often a few will be lost during a midnight raid but always there are some survivors. A really enjoyable trio of photos Mary, you must have quite a large pond. 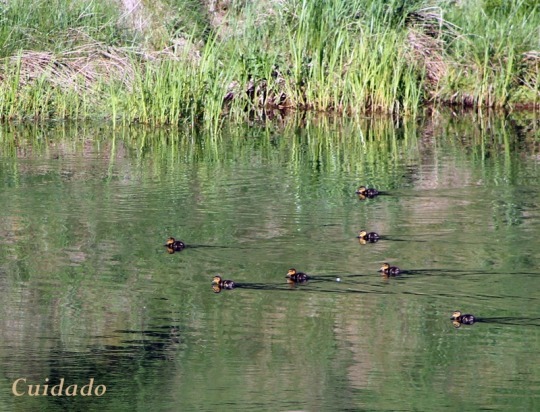 Mary MacADNski: Yes, it is a great place for wildlife. Mary MacADNski: It has been a great source of wonderment for thirty two years. Mammi Heron has a good overview over her little ones. I like all the three pictures. Mary MacADNski: I wanted to know the German for Monsieur for Chad's reply. I knew a Mister Heron and he was from Germany. Mary MacADNski: You are right about the heron's disturbing the bottom for the ducks. There are lots of symbiotic relationships in a pond. I am glad being home has improved you further. Great fun, finding old pics! Mary MacADNski: I knew of them of course and even posted some at the time but then they were put away in that silly folder. Some I have looked for forever, ones from next week in particular. Mary MacADNski: It is like a wonderful gift. Some photos I have been looking for, ones from next week in particular. I reckon you knicked those shots from someone called Cuidado, Mary. Mary MacADNski: In my info here it says Mary or Ciudado. Neither are real. I have been known as Cuidado for a long time. Mary has been used only on SC.